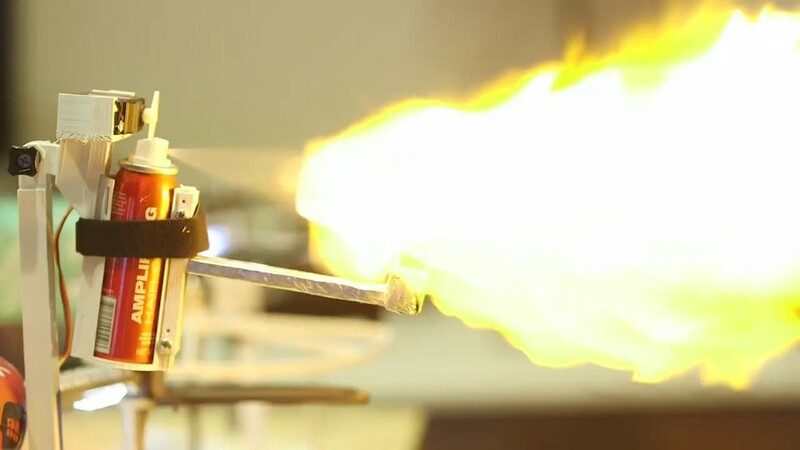 Connecticut lawmakers want to ban drones that are armed with guns and even flamethrowers. This has been a hot-button issue ever since July 2015, when a teenager posted a video of a drone shooting a handgun in the woods in the state's coastal town of Clinton. He weaponized the drone himself. The video, called "Flying Gun," went viral, and has been viewed more than 3.5 million times. The teen, Austin Haughwout, followed up in December with another video, called "Roasting the Holiday Turkey." 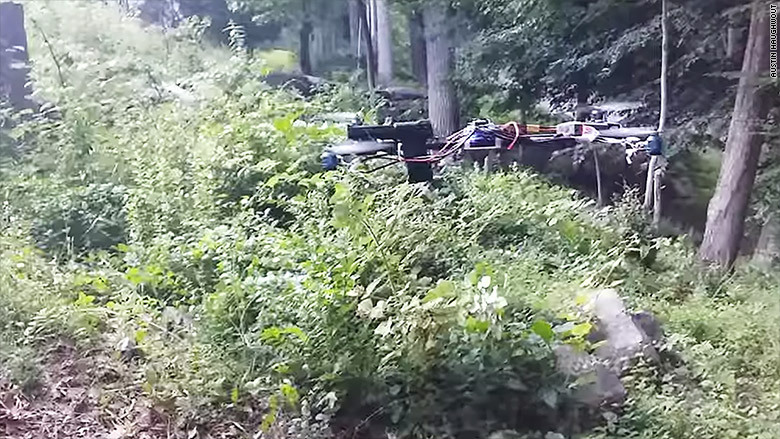 It shows a drone with a flamethrower roasting a turkey on a spit, also in the woods. That video has been viewed half a million times. And it appears to be perfectly legal. "The initial investigation showed that he was not in violation of any existing law," said Greg MacKinnon, spokesman for Rep. Christie Carpino, who is sponsoring the legislation to outlaw armed drones. 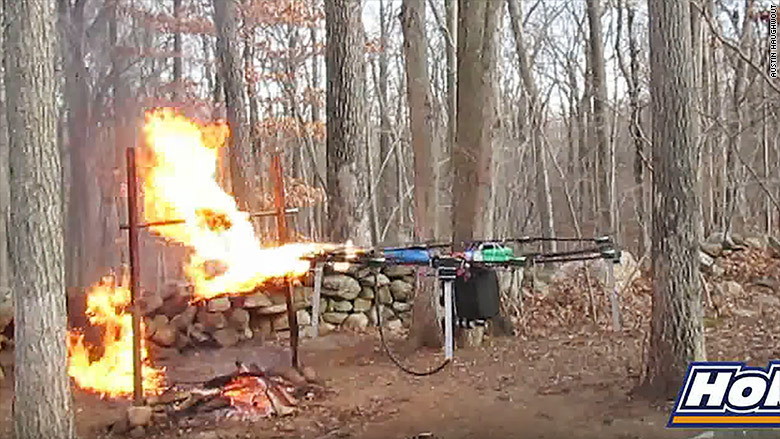 A Connecticut teenager's video of a flamethrower drone roasting a turkey has inspired lawmakers to try and ban it. Sgt. Jeremiah Dunn of the Clinton Police Department said the drone is not illegal if the gun is legal and it's fired at a legal location. He said the videos are believed to have been filmed on private property owned by the Haughwout family. And he said there are no laws preventing the flamethrower drone, either. A spokesman for the Federal Aviation Administration said it's still investigating to see if FAA regulations have been violated. Lawmakers around the country are trying to ban gun-mounted drones after the "Flying Gun" video went viral last year. This videos prompted Connecticut lawmakers to submit legislation to ban weaponizing drones. One of the bills, raised by the committee chaired by Carpino, would ban anyone from arming drones with tear gas or "a deadly weapon, explosive or incendiary device." It would also restrict the use of drones by police. "Actions like this are reckless and dangerous," Carpino told CNNMoney. "They put people and property in harm's way. The videos highlight the fact that technology sometimes gets ahead of the law. There's no valid reason to weaponize drones." Carpino said that the teenager who made the videos attended the public hearing Monday for the bill. But Haughwout did not answer emails from CNNMoney asking about his weaponized drones. Connecticut isn't the only state to try to do this. North Carolina and Wisconsin banned weaponized drones in 2014 and Oregon banned them 2013, according to the Association for Unmanned Vehicle Systems International, an organization that promotes drone technology and robotics. Nevada banned them last last year. "There's one thing that I think makes people recoil the most: they see those drone-firing videos and they want no part in it," said Las Vegas Assemblyman Elliot Anderson, a Marine veteran of Afghanistan who supported the bans. Nevada is a hot bed for manufacturing and testing drones by companies like Drone America. Anderson said the legislation was partly to safeguard that growing industry. "The goal behind prohibiting weaponizing was to make people comfortable with the industry and to make it prosper," said Anderson. Nevada is also home to the Creech Air Force Base, which operates armed drones for the military like the MQ-1 Predator and the MQ-9 Reaper. Anderson said the base is not affected by state legislation. Lawmakers around the country have been ramping up their efforts to regulate drones. Legislators in 45 states considered 168 drone-related bills last year, according to the National Conference of State Legislatures. Lawmakers in West Virginia, Oregon, New Hampshire and Michigan banned the use of drones in hunting.